As an elementary teacher, some of the most common questions I get come from parents wondering how to start teaching the younger siblings of my students… think toddlers and pre-kindergarteners. I don’t consider myself an absolute expert in the area, but I have picked up some helpful information over the years. For example, I know it’s more effective to encourage learning by exposure and example far more than pushing beyond readiness. Where pushing creates resentment, exposure through play and fun creates natural curiosity. Here are some simple educational baby play ideas for raising an eager and capable learner. Discovery baskets are collections of related items meant to give babies and toddlers a way to explore the world around them in a safe and supervised environment. They are especially focused on using the five senses rather than sight and hearing only as a child would be limited to with TVs. Learn more about this hands-on approach to learning and development here from CBC. Shape matching toys are a great way to help small children learn to make classifications and practice fine motor skills. Melissa & Doug offer a durable and affordable matching toy here. Discovery bottles let Baby explore without the hassle or mess. HORRAY! Simply fill a bottle with small objects and/or liquids and let your little one be amazed with everything inside. Get more information from The Imagination Tree. Construct a colorful sensory zone that will keep Baby enthralled for minutes on end. Find the DIY here. Help your child learn sorting and matching skills by using colorful cereal. You can easily make a color matching mat by drawing colorful circles on a paper. You can make tasty string necklaces once you’re done as well. Get inside the loop here. A word building travel kit will help your kids learn not just their ABCs but also how to identify and spell simple words. How nice that you can take meaningful learning on-the-go! I Heart Crafty Things shares the DIY here. Use irresistibly fun dot markers for alphabet recognition practice. You can find this and four other great letter recognition activities on Pages of Grace. Don’t be afraid to teach whole word recognition even before your child has mastered the alphabet. The more connections a child can make between letters and words, the more progress they will make. Find the free printables, instructions, and more popcorn activities here. It’s always cute when a child proudly counts to ten but forgets a few numbers along the way. “One, Two, Four, Ten”. But cute or not, they’re better off being corrected and given ways to practice ALL the numbers. Sequencing puzzles are a fun way to use visual queues to master numbers. You could do the same thing with the alphabet as well. Make, Take, and Teach explains more. Practice letter sounds and phonics with egg match letter blends. All you need are plastic eggs and a sharpie. More information found here. Mastering the alphabet has never been so flavorful! 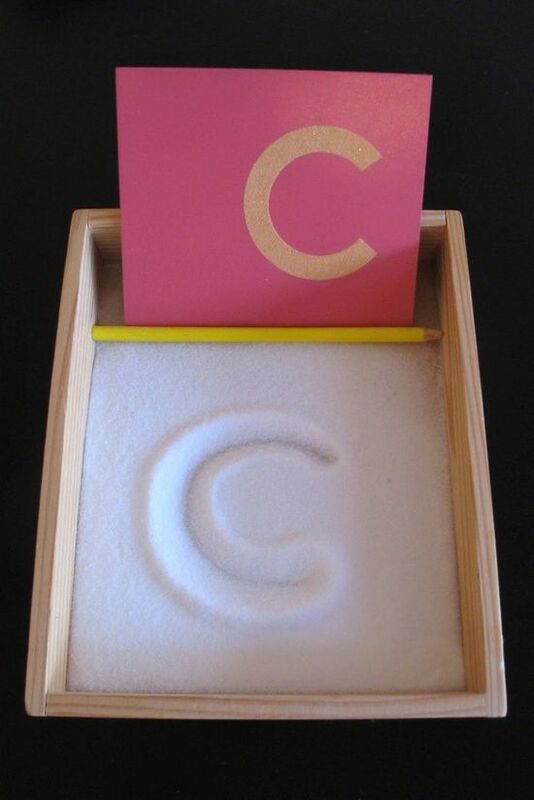 Let your child trace the ABCs (and pronounce them too) in a tray full of salt. They’ll be dying to get their fingers moving and you’ll be loving how much they learn! Image source. Turn learning into a scavenger hunt with this sensory game. Find buried letters to match with what’s shown on the mat. Number hunts are just as attention-keeping and effective! Unbury more information here.